If you want a cheaper, and eco-friendlier, alternative to new asphalt, milling is exactly what you need. Asphalt milling is the process of removing part of the surface of an already paved area, grinding it up, and using it again. Essentially, it is recycled asphalt pavement and a great way to save money and still get a fantastic asphalt surface. Did we mention it saves you money? Recycled asphalt requires much less raw materials, since it is just crushed remains of former asphalt projects. Since little to no new materials are needed, choosing asphalt milling can be a very economical choice. Asphalt is non-biodegradable, which means that when old asphalt is tossed into landfills, it just sits there indefinitely. By recycling asphalt through asphalt milling, we make sure old asphalt doesn’t go to waste and take up much needed space in already cluttered landfills. Though asphalt millings do not look exactly like regular asphalt (more of a cross between gravel and asphalt surfaces), that doesn’t mean your asphalt milling surface will look like a Frankenstein mashup of random asphalt chunks tossed together. We make sure your asphalt milling surface looks great and professionally done. Asphalt milling is also a good option for a roadway that has become too elevated due to many repavings. The process of asphalt milling will remove a few inches off the top of the surface without damaging the road. Milling is a recycling and repaving procedure. We will remove only the top layer of asphalt from a surface, leaving the sub-base intact, so that the new asphalt can be installed over the top. The result is a beautiful, smooth, new surface of asphalt. Asphalt milling requires no resurfacing, refinishing, or replacing. Overtime, instead of weakening, it simply hardens and becomes even stronger. Unlike gravel, asphalt millings produce less mud and dust, so less cleanup is needed with this process. If you are looking for a cost-effective material that is also environmentally friendly, call Pavemaster for our asphalt milling services. 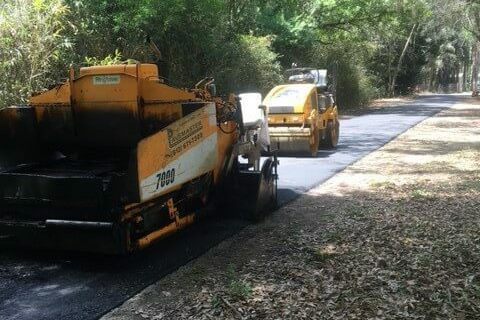 Pavemaster is a Tampa Bay paving company that provides complete commercial, industrial and residential asphalt paving services.